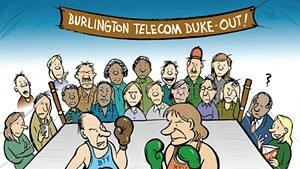 [Re "How the Burlington Telecom 'Debacle' Divided a City Council," December 6]: As a former Burlington city councilor, I've watched the latest Burlington Telecom travails from afar, alternately amused, aghast and, in the end, keenly disappointed. Councilor Dave Hartnett's posturing has been unconscionable. Bellowing expletives, storming out of meetings, personal attacks and self-congratulation have become standard fare for him, regardless of whether the topic is BT, commission appointments, walk-bike master planning, smoking in parks or supporting organized labor. Given his frequent pronouncements trumpeting transparency, it was particularly hypocritical for Hartnett to play a closed-door role in leading Schurz Communications/ZRF Partners to the BT trough. Kudos to Councilor Joan Shannon for standing up to his melodrama. Keep BT Local's proposal was the weakest from the outset of deliberations last spring, when I was still on the council. It's particularly troubling to hear Councilors Max Tracy and Ali Dieng imply that all for-profit entities are conspiratorial capitalists interested only in fattening up BT for Comcast's ultimate consumption. Ting/Tucows has a well-deserved reputation for being precisely the kind of successful, socially responsible company Vermonters have long championed. The fact that KBTL's board, by one scant vote, rejected an opportunity to partner with Ting in operating BT is most unfortunate. Had I still been serving on the council on November 6, I'd have supported Ting with no qualms, and a last-minute gamble on BT's future would've been avoided. The failures of Schurz to commit to net neutrality and ZRF to reveal its investors should be subjects of grave concern for the Burlington City Council as it ponders a final BT purchase agreement. The loss of our Burlington Telecom is an unpopular decision ["How the Burlington Telecom 'Debacle' Divided a City Council," December 6]. The city councilors who approved the sale to out-of-town investors should be held accountable. It's time for long-serving city councilors to move on and make way for new members. On March 6, there will be an opportunity to elect councilors with a sense of decorum and responsibility to those they represent. ["A Gunshot Survivor Aims to Secure Background Checks in Vermont," December 6]: It should surprise no one that Gun Sense Vermont has had little success in efforts to restrict Vermonters' lawful gun rights. I assert that the board president's description of the group as "a bit dormant in the past year" describes the entire five-year history of the group. Gun Sense has never had 5,000 members they can document, unless you count Facebook "likes," as they have historically not charged a membership fee or asked for annual updated membership info, as do legitimate advocacy groups such as the American Civil Liberties Union or Gun Owners of Vermont. Nor have they ever produced important, impactful numbers at public hearings. When the legislature held a public hearing in 2015, we in the gun rights community turned out 10-1 against. Any group that struggles to turn out people to the biggest public hearing in Vermont since the civil union debate, on their own bill, is certainly not grassroots nor statewide. That hearing spilled out of the House and filled the halls and all available spaces, including the cafeteria. Vermont has no background check problem. All private gun shows require background checks for any sales that occur at their events. That Vermont is the safest state in the nation escapes notice at the ideological bubble of Gun Sense. A Vermont Public Radio poll also asked respondents for a rating of issues according to importance; only 1 percent chose guns as a priority issue. Reporter Alicia Freese should have added the contrast for full disclosure. The aforementioned error begs the question: Did she just take Clai Lasher-Sommers' word for it? 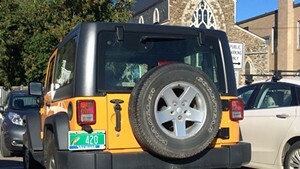 Moore is a board member of the Vermont Traditions Coalition. In last week's Fair Game, columnist John Walters used the reporter's privilege to slam his bosses and the rest of the print media in Vermont. His ire was directed at the near-unanimous rejection of an amendment to the Vermont Press Association's constitution to redefine the definition of "newspaper" to include digital-only sites, specifically VTDigger.org. Those present at the meeting voted 31-1 against the amendment, including a "no" from Seven Days. Ignoring what others might have considered a collective wisdom, Walters suggested VPA members were "shortsighted at best." The VPA is a business association that represents the print newspapers of Vermont. To change our charter to redefine newspapers for the sole advantage of VTDigger makes no sense. It's counterproductive to the business interests of the members. Allowing VTDigger to become an associate member of VPA, which Walters derided as giving them "a seat at the kiddie table," is quite the opposite. An associate membership allows VTDigger to share in the lobbying efforts of the VPA to fight for open records, shield laws and other journalistic interests. It also allows them to enter VPA's professional contests to compete for awards. Digital-only news organizations also exist regionally, and VTDigger can easily join those. The primary reason VTDigger is pushing for full membership is to compete for public notice advertising. And that's OK. It's competition, and the easiest way to win is to get your opponent to capitulate. That 31 publishers agreed not to capitulate should not be surprising. 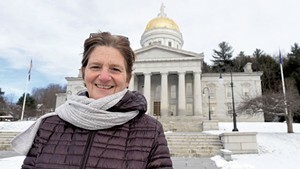 Lynn is publisher of the Middlebury-based Addison County Independent, Vermont Sports Magazine, Vermont Ski + Ride, the Reporter of Brandon, and the Mountain Times of Killington, as well as copublisher of the Essex Reporter and Colchester Sun. He has served as president of the Vermont Press Association and the New England Newspaper & Press Association.